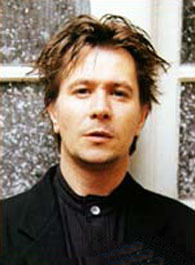 Gary Oldman is a British actor, famous for his rogue's gallery of demented film characters. Oldman was Lee Harvey Oswald in JFK, and Pontius Pilate in Jesus. He was Sid Vicious in Sid & Nancy, subversive gay playwright Joe Orton in Prick Up Your Ears, the murderous Sirius Black in Harry Potter and the Prisoner of Azkaban, a drug-addicted DEA agent who loved Beethoven in The Professional (aka Leon), and a bitter Beethoven in Immortal Beloved. In True Romance, Oldman played a white gangster who seemed to think he was black, and in Hannibal he played a wheelchair-bound murderer with no eyelids, lips, or nose. Oldman's father was a machinist and seaman with a fondness for the bottle, and his parents divorced when he was a grade-schooler. Many years later, Oldman wrote and directed his unpleasant masterpiece Nil By Mouth, dedicated to his father and clearly inspired by him. Raised by his mother and two older sisters, young Oldman taught himself to play the piano, though the family didn't have one, by laying out cardboard 'keys' on the kitchen table. Oldman says he "was marvelous on the silent keyboard", but he decided he'd be a better actor than pianist. At 15 he signed on with the Greenwich Young People's Theater, and at 17 he applied at London's prestigious Royal Academy of Dramatic Art, but was rejected. He studied instead at the Rose Bruford School of Speech and Drama in Kent, and within a few years he was on stage in London's West End. His first film work was a small part in the BBC TV movie Remembrance (1982), and his first leading role was in Sid & Nancy, four years after. To research that role and completely capture the over-the-top singer's personality, Oldman hung out with Vicious's mother, as well as with heroin addicts. He also lost thirty pounds (which led to a brief hospitalization), and taught himself to play a Fender bass. That was really Oldman singing "My Way" and "I Wanna Be Your Dog" in Sid & Nancy. He was arrested for drunk driving in 1991, and checked himself into an extended rehab program in 1995. Booze has been a key factor in the end of most of Oldman's romantic relationships. Oldman met his future ex-wife, Donya Fiorentino, at an Alcoholics Anonymous meeting. In the divorce case, she maintained he'd beaten her and had serious drug and alcohol addictions. In subsequent custody trials she's testified that their son Charlie says he's beaten him. Oldman says he's uncomfortable with Hollywood-style schmoozing, and his disinterest in doing publicity has cost him several roles. At his agent's suggestion, he once briefly hired a publicist and spent several weeks doing the talk show circuit, but couldn't stand it.